We operate a variety of threading machines, which gives us the ability to do a lot of different custom threading jobs. Cut threads or rolled threads, high production or small special runs, all are within our capabilities. 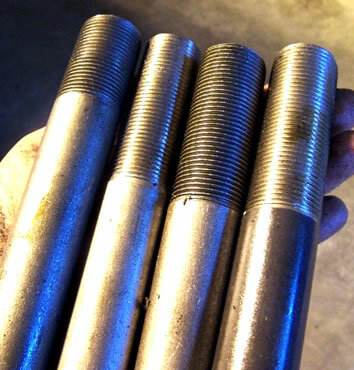 As a premier manufacturer of threaded studs, Connection Service Company can manufacture steel threaded studs, aluminum threaded studs, stainless steel threaded studs or brass threaded studs, in any length and any thread pitch (provided dies are available). Single or two-sided threaded studs, straight or bent, we can even drill cross holes for custom threaded studs and other fasteners if needed. Also see our Custom Plating Options page.